Are you spending all your time working IN your business and not ON your business? Are you striving to achieve the next level of growth in turnover and profitability? Or, working hard without seeing the results? Perhaps you are facing staffing issues or you are planning to build the value of your business for financial security. Whatever business challenges you are experiencing, Business Doctors can help! 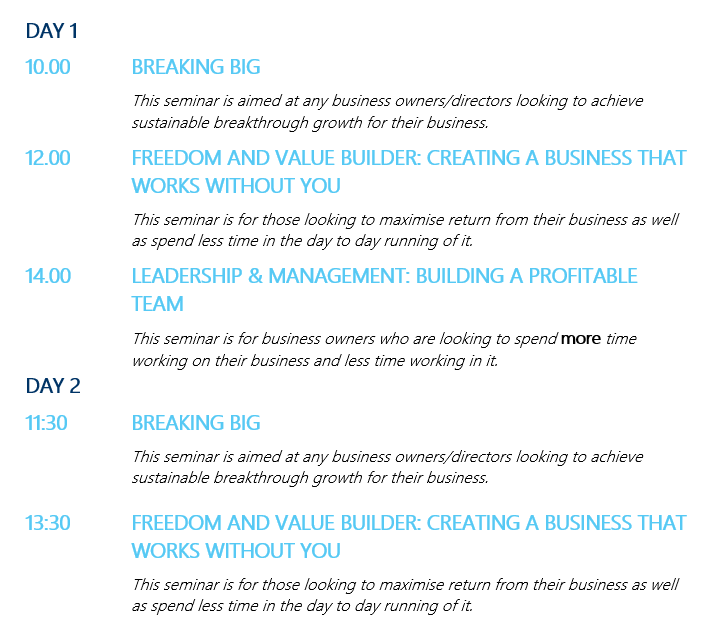 The Business Doctors will be running a range of seminars across the two days, designed to help you and your business. They will also be hosting an open ‘surgery’ for those looking for some one one one guidance – you can visit their stand for chat at your leisure. The Business Doctors specialise on hands on support for small and medium sized businesses and over the past thirteen years, have helped hundreds of companies to achieve their vision. Their informative seminars, taking place at the Business Doctors Surgery at the show, will cover a wide range of topics and are guaranteed to give you food for thought. Click on the table below to view a more detailed description of each session.